What are the advantages of having a User Account? Better control over the service as well as the ability to customize the services to choice. Much larger and customizable Favourite Shops folder. All preferences, Favourite Shops and settings are permanent and accessible from any computer or device. Ability to manage, activate, deactivate newsletters/updates and their frequency. Users with accounts are the first to receive new deals, discounts and offer updates/newsletters they have signed up for. SignUp now for free and start saving more with ZealDeal! Is there any fee or charge for a User Account? No, it is absolutely free ! Where can I signup for a User Account? Click on the Signup link at the top-right corner of our site or just Click Here to begin. In the signup interface, enter your E-Mail and hit the 'Proceed' button. Then simply follow the instructions on the screen. Note: It usually takes about 30 seconds or so to complete the process. Moreover, it is absolutely free. Join us now and never miss the money saving Voucher Codes, Discount Codes, Special Offers and Hot Deals in UK. How do I login to my User Area? Click on the Login link at the top-right corner of our site and the Login Pane will appear. Just enter your E-Mail and password and hit the 'Login' button. Note: If you lost or forgot your password, you can recover it by using the 'Recover Password' link on the 'Login Pane'. What does the "Remember me on this device" option do? This option appears on the 'Login Pane' (just click on the 'Login' link to see the 'Login Pane'). If checked, the system goes into 'Auto-Login' mode and will automatically log you in next time you visit ZealDeal. 'Auto-Login' can be cancelled simply by hitting the 'Log Out' link. Go to your Dashboard and use the Password tab. 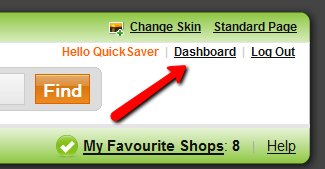 User 'Dashboard' can be accessed anytime by clicking the 'Dashboard' link as shown in the picture on the right. Note: 'Dashboard' link will appear after logging in. Go to your Dashboard and use the Change E-Mail tab and following the instructions. I want to change my 'Nickname'. How can I do that? Go to your Dashboard and use the Personal tab.